Karen leaders based inside Burma said they are satisfied so far with the way the ‘peace talks’ between the Karen National Union and the government delegations are progressing. The Karen Member of Parliament, Nan Say Hwa from Hpa-an told Karen News that there is more support for the KNU’s the second round of peace talks than for the first round. Nan Say Hwa said people would be carefully watching to make sure both sides obey and implement the agreed points made during the peace process. Ms Susanna Hla Hla Soe, the managing director at the Karen Women’s Action Group in Rangoon said she assumed the peace process will run smoothly as KNU met with President Thein Sein and Daw Aung San Suu Kyi. Ms Susanna Hla Hla Soe told Karen News. Ms Susanna Hla Hla Soe said she is willing to work with the Karen Women Organization when there is more freedom in Burma. She said that KWAG would be working together, for peace in Burma, with both Karen youth groups and Karen organizations based inside and in foreign countries. A Karen member of the National League for Democracy based in Rangoon, U Saw Nai Nai, said that political dialogue is the best way in solving the political problems with other ethnic people such as the Chin, Kachin, Shan, Mon and not only with the Karen. U Saw Nai Nai said. U Saw Nai Nai also says that the NLD party is also willing to cooperate with Karen organizations for political activities if the objectives and activities are compatible. The KNU 16-member peace talk delegation led by general secretary, Naw Zipporah Sein met with the Burma government’s delegations at state level and federal level, President Thein Sein and newly elected Member Parliament and NLD leader, Aung San Suu Kyi during their trip from 4-10 April. 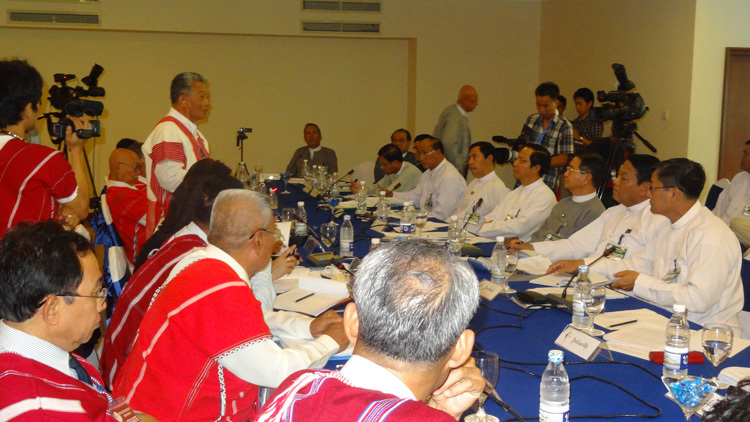 KNU met with a number of different Karen communities, Karen civil society organization leaders, Karen political party leaders, religious leaders, and other ethnic individual leaders to seek their comments. The KNU delegation arrived back to the Thailand-Burma border on 11th April.